Well here we are in our 2010 AFL Footy Season, it certainly doesn’t seem like it was last year that I was sitting watching my team “St Kilda Saints” loose the Grand Final. For a Saints supporter tonights game is going pretty well, looks as though we will probably win. What is weird is this is the first Saints game in the last three seasons I have watched without my Dad sitting with me. Dad was a Saints supporter all his life and of course me being a Daddy’s girl I had to follow them as well. During the time he lived with us, especially in the last 12 months of his life we had our special time watching the game together. I know he is in a happy place with his loved ones but it sure does make me sad to be sitting here without him – physically that is, cause I know he is here otherwise I wouldn’t have had the urge to write about him. This is my baby Buddha Shane gave me for my birthday. indulged slightly. So my “Davine Time” today was to feel sorry for me with a hangover. It's not a major hangover, just really tired from only getting 3 1/2 hours sleep. 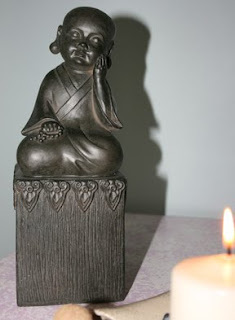 Love the newest Buddha, I don't envy the hangovers one bit! lol I hope you get plenty of rest and are back to yourself tomorrow! Hangovers are no fun. Hope you can get some rest.